Hen Do Goody Bags | Keeps Me Out Of Mischief! It’s a busy year for our family. Both my middle sister and I have had baby boys and my other sister is preparing to get married in September. As one of her bridesmaids I’ve been preparing for her surprise hen-do. When it was my hen-do my bridesmaids made goody bags which we opened at the meal in the evening. I wanted to repeat this for my sister but I wanted to make them a bag that they could use afterwards so that each time they used it they thought of my sister and remembered our weekend away together. 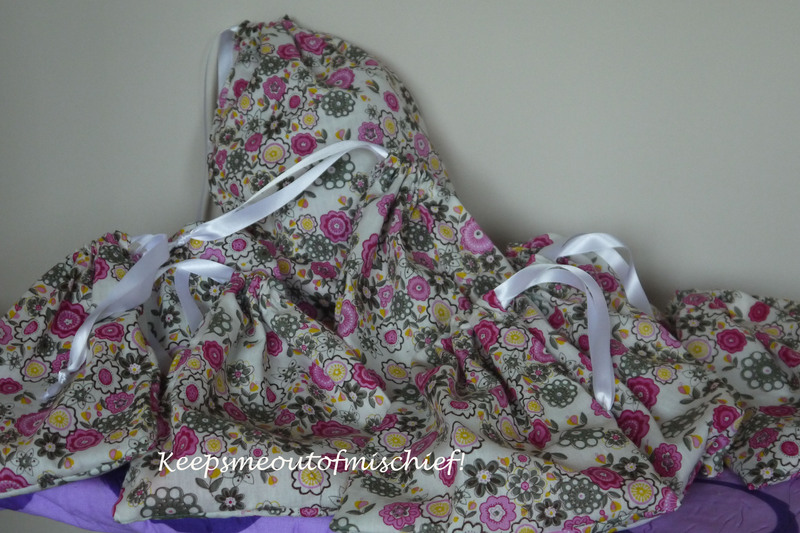 I used my stand-by drawstring bag method, tutorial here. I’ve filled them with various bits and bobs to decorate costumes and the table at the restaurant.